Shepard was a man of few words, many of them mumbled. Compelling to look at but hard to read—at once intellectually savvy and emotionally guarded—he exuded the solitude and the vagueness of the American West. Though Shepard lacked East Coast sophistication—he was poorly read in those days—he brought news of what he called “the whacked out corridors of broken-off America”: its blue highways, its wilderness, its wasteland, its animal kingdom, its haunted lost souls, its violence. “People want a street angel. They want a saint with a cowboy mouth,” a prescient character in one of Shepard’s early one-acts said. Shepard, it turned out, was the answer to those prayers. Read the whole piece for an interesting take on this stellar playwright's Western roots (and the notion of the frontier as muse). 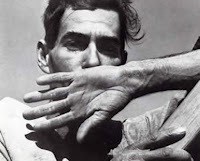 And that's neither Shepard nor a "saint with a cowboy mouth" at left; rather, it's another classic from iconic photographer Dorothea Lange (perhaps a street angel of another kind?) and one of the treasures of the chronicles of the American West. Did you know she lived in San Francisco, just over the hill from here?